Synchronizing with the advancements taking place in the industry, we are engaged in providing services via Steel Roofing Fabrication Work. Appreciated owing to its uniqueness, this service is provided in accordance with the evolutions of this commercial market. Apart from this, this is undertaken by our team of professionals, which holds extensive knowledge in this domain. Best quality of Galvanized Roofing Fabrication Work is provided by us to customers as per their requirements. Keeping the diverse requirements of customers in mind, we are instrumental in rendering Steel Roofing Fabrication Service. Approx Rs80 to Rs 110 as per the Quality and Size. Backed by our skilled professionals, we are involved in providing Steel Fabrication Work. Owing to the vast industry experience and in-depth knowledge of this domain, we are offering a huge collection of high-quality Sheet Covering Fabrication Work to our valued clients. These services are precisely offered with follow set industry norms as per the requirements of our clients. These services are rendered under the supervision of experienced quality controllers. Assisted by a crew of dedicated professionals, we are able to offer high quality services Steel Roofing Fabrication Works. We offer this fabrication work for diverse types of commercial and residential structures with the help of advance tools and technology. 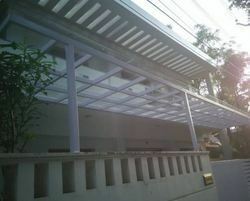 Being the reckoned name in the industry, we execute well-planned and organized range of Steel Roofing Fabrication Work. 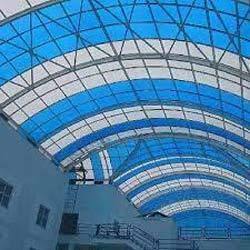 Our clients can avail from us steel roofing sheet fabrications, which are widely acclaimed for features like corrosion resistance, easy installation & removal and long lasting life. These are manufactured using high grade steel as per the international quality standards. Further, sheets are available in various specifications for our clients.